I really enjoyed reading your post and then reading the links. We really do need to keep up with being stylish don’t we. I am always wishing I could wear my favorite things from 50 yrs ago!! There are so many stylish things in our age range,,thanks for getting me thinking about this. Pamela, there are so many stylish bloggers in our age group these days. They inspire me too! You sound plenty hip and stylish to me! First of all, I love that photo of you! Very stylish! I will have to catch up on the fashion blogs. Thanks for posting. It’s amazing how certain colors can brighten your look and your day! I really think the transition from my younger body to my older body was soooo hard. After I had Carly Jo at 36 I never did get back to my previous size but was still trying to dress that way. Finding ways to dress more appropriately for my body type and age but still looking like I as with the times was a challenge. You are funny! I can see you hanging out in your short shorts and t-shirt. I’m sure you look good in everything you wear but sometimes we just have to not worry about it. LOL – Well, I looked pretty rough that day…. 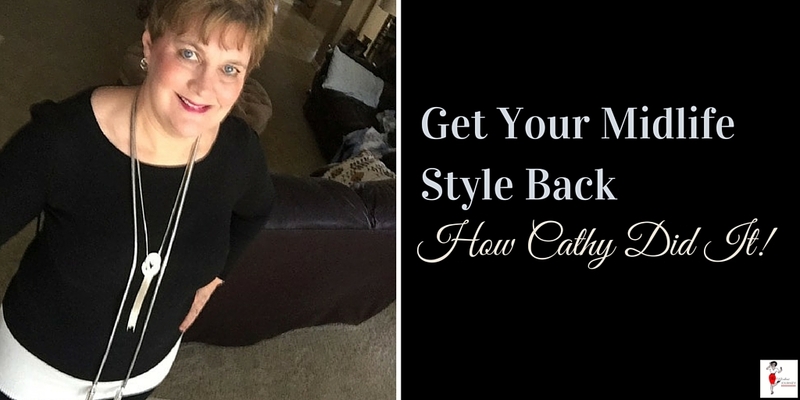 Loved reading your post Cathy and you’ve inspired us with your midlife style. Thanks for sharing with us at #overthemoon link party. Hope you are safe and sound from the bad weather last week. I still work outside the home in Corporate America so it’s hard for me to dress down even on weekends. I often feel bad for hubby because when I come home and change, it’s always shorts and a t-shirt but always dresses, skirts and heels for work!